Home > News > Portland Street Honda Blog > Portland Street Honda: We Are Renovating! Portland Street Honda: We Are Renovating! Thirteen years ago, Portland Street Honda moved around the corner to its present Baker Drive location. Complete with an in-house cafe, Drive Thru Service reception, multiple waiting areas and a welcoming open concept, the “new” Portland Street Honda was undeniably focused on customer comfort and convenience. Following the example of the All New 2016 Honda Civic, we’re taking everything our customers know and love about our current dealership and vastly improving upon it. In February of 2016 we began extensive renovations on our Service Department and Parts Department and Sales floor. The new dealership design will introduce not only a sleek modern style, but also welcome features like a much larger showroom floor, dramatically improved cafe and waiting areas and a more open and accessible Service experience, just to name a few. We greatly appreciate the ongoing cooperation and patience of our Customers as we continue to press forward with these exciting improvements to the Portland Street Honda experience. The renovations are expected to take place in phases, over a series of weeks. 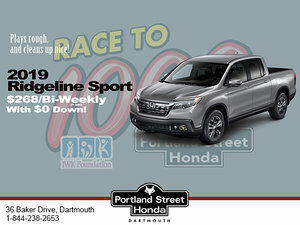 For more information, you are invited to follow the ongoing updates posted via the Portland Street Honda website, as well as Twitter and Facebook. We look forward to inviting you to experience and explore the new dealership design very soon! Is this model for you? Get in touch with us! Browse our showroom online!